Two moments of football skill (association-style) from a fervent Manchester United fan settled this international in favour of a functional and efficient England team at Old Trafford. Mark Cueto struck in the 60th and 80th minutes when his deliberate football-style dabs set up Delon Armitage to touchdown twice to continue his emergence as a fullback of substance this season. England's first try had come from another emerging figure in the muscular form of Matt Banahan, the Bath wing. They were uplifting moments on an afternoon which had started in the gloom and rain of a Manchester in June. Thankfully, for a crowd of around 40,000, the action started in dry conditions after the early deluge had sent fans scurrying for cover in the surrounding streets and pubs. Cueto and Armitage were among the clutch of England players that rewarded the decision of England manager Martin Johnson to go for the tried and trusted of the Guinness Premiership rather than those unpredictable youngsters, led by Danny Cipriani and Shane Geraghty. Instead of Manchester and a week-long trip to Argentina, Cipriani and Co. are in the United States on duty for the Saxons in the Churchill Cup. Cueto, Armitage and their fellow senior players are too hardened to the ups and downs of professional life to worry too much about Cipriani. It is every man for himself these days and their next stop is a return Test in Salta, in the foothills of the Andes, to finish off a long season next Saturday. However, the 'Theatre of Dreams' deserved to see more adventure from England. The two tries by Armitage, backing up a first-half touchdown by Banahan, stemmed a recovery by Argentina after the afternoon threatened to be nothing more than a kick fest between Andy Goode and Juan Martin Hernandez. Goode did what he does best. He landed eight shots at goal (four penalty goals, two dropped goals and two conversions) for a haul of 22 points. He at times, though, tested the patience of the Old Trafford crowd who whistled and hooted when he went for another drop goal rather than trying to further an attack in the second half. Two penalty goals and a dropped goal from Goode had given England the impetus to head Argentina 9-3, Hernandez having struck first by dropping a second-minute goal. 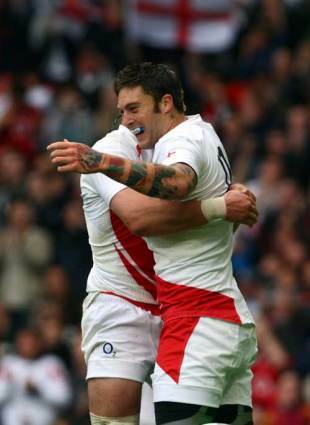 The duel was lifted by a bright piece of England play where forwards and backs combined to give Banahan, one of the tallest and heaviest backs to where the Red Rose, to score a try on this debut. And it was a touchdown to remember as well. James Haskell and Nick Easter combined to burst away down the short side followed by a quick pass from Cueto to give Delon Armitage some space on the right. Armitage showed his sense of opportunism by putting Banahan into space through a neat chip. And the big wing, arms and legs pumping, had the agility to bend sufficiently to grab a bouncing kick to forge clear, joyously punching the air for a score on his England debut. Goode converted for a 16-3 lead and added another penalty in between two more kicks from Hernandez as England turned round 19-9 ahead. Banahan was back in the thick of the action straight after half-time. He popped up in midfield to back up another charge by Easter this time being backed up by Steffon Armitage. The move should have brought England some more points but Goode's decision to put in a trademark chip for the corner ended in Louis Deacon, stuck out on the wing, making a hash of collecting the kick. Instead, the outside-half quick made amends by adding a fourth penalty goal following an offence by Argentina. Argentina threatened to cut the lead by grabbing two more penalty goals from Hernandez before Goode's fourth penalty goal heralded a brighter passage from England that ended in Cueto's footballing skill setting up Delon Armitage. Care, for once, escaped his markers to demonstrate the pace that makes him such a threat at his best. He burst clear of his defenders to thrown a pass out that Cueto controlled by side-footing ahead into the pathway of the fullback who showed why he has been England's man of the season. To finish off, giving the Old Trafford crowd a final upbeat moment, Goode pinged out a huge cross-field clearing kick which Cueto caught, left-footed, on the volley. Armitage, by then could do no wrong, and raced clear to touch down. For once, Goode missed the conversion. As for Argentina, this match was all about much-needed money. The Federation switched the game to Old Trafford in an effort to raise cash to help nurture their emerging game in South America and make sure their European-based players were available. They will look for a more committed display in Salta next Saturday. Argentina: Agulla (Brive), Aramburu (Dax), Tiesi (Harlequins), Avramovic (Montauban), Camacho (Harlequins), Hernández (Stade Francais), Vergallo (Dax), Lobbe (Toulon, captain), Leguizamon (Stade Francais), Galindo (Racing Metro), Albacete (Toulouse), Carizza (Biarritz), Orlandi (Rovigo), Basualdo (Toulouse), Roncero (Stade Francais).